Photo of Alexis Martin & Louis Belanger at the 2017 Prix Iris © 2017 by Maurie Alioff. Used with permission. 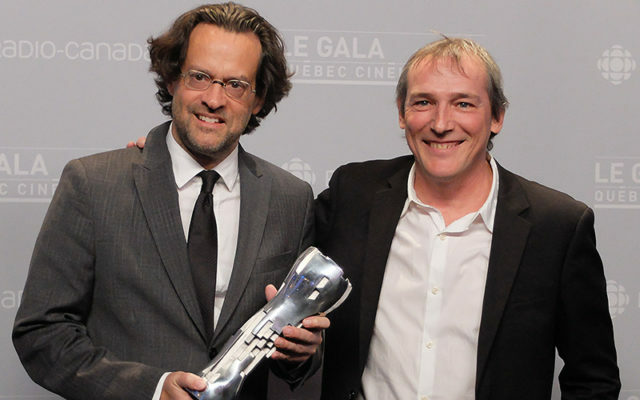 Alexis Martin is pictured holding a 2017 Prix Iris which he shared with Louis Belanger for their screenplay for Les mauvaises herbes. Martin graduated from the Conservatoire d’art dramatique de Montréal in 1986 and is known in Québec for his work in theatre both as an actor and playwright. He has played most of the major theatres in the province including the Théâtre du Nouveau Monde, the Nouveau Théâtre Expérimental, the Théâtre de Quat’Sous , Théâtre Ubu , Théâtre de La Licorne , and the Nouvelle Compagnie Théâtrale. As a playwright he has written, Oreille tigre et bruit, Matroni et Moi, and co-written L’An de Grâce (with René Richard Cyr and Claude Poissant ) as well as L’Apprentissage des marais (with Cyr). In 1992 he won the Montreal critics’ award for best supporting actor for En attendant Godot. His Révolutions was presented in April of 1999 at Espace Libre in Montreal. In February 2000, his co-adaptation (with Dominic Champagne ) of L’Odysée ran at the National Arts Centre and TNM. In September of 2008 he was awarded the “Auteur dramatique Banque Laurentienne” Award, which comes with a $10,000 cash prize, after being named favourite playwright of the 2007-2008 season by subscribing patrons of Théâtre d’Aujourd’hui. 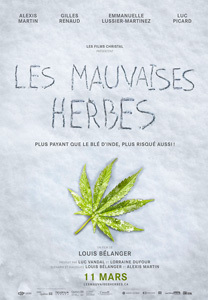 Poster for Les mauvaises herbes courtesy of Les Films Séville.